Alan Rickman as Hilly Kristal. “There’s something there,” reads the comic-book word balloon hovering over the famed marquee on New York City’s Bowery, which for three decades read “CBGB/OMFUG” (“country, bluegrass, blues & other music for uplifting gourmandizers”). 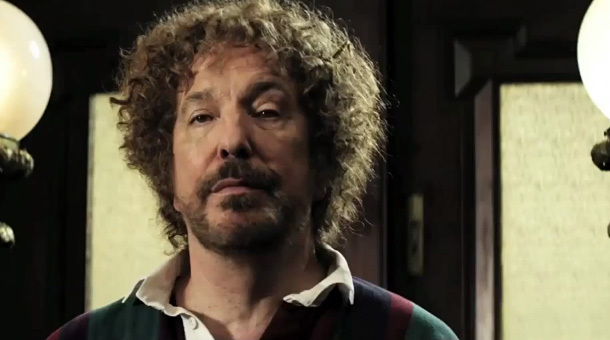 “There’s something there,” Alan Rickman-as-Hilly Kristal thinks in the new film featuring that final shot, CBGB, when he first walks into a flea-, rat-, and roach-infested bikers’ bar at Bleecker and the Bowery, prior to buying the place with money borrowed from his mom (Estelle Harris, a.k.a. George’s mom on Seinfeld). “There’s something there,” the renowned thespian and veteran of both the Royal Shakespeare Company and Hogwarts says many times in the film, whenever he grants a grudging first listen to bands such as Television, Talking Heads, the Ramones, Blondie, and the Dead Boys. And there is, indeed, something there in the movie by director Randall Miller, previously best known for Bottle Shock (2008) and a fair amount of television you probably didn’t see. In fact, there are a couple of things there, starting with a killer soundtrack featuring some of the best rock ever recorded—from “Kick Out the Jams” by the MC5, “Friction” by Television, and “Heroin” by the Velvet Underground to “Blank Generation” by Richard Hell & the Voidoids, “Psycho Killer” by Talking Heads, and “I Wanna Be Your Dog” by the Stooges—but also including a mostly solid cast (Johnny Galecki as Terry Ork, Harry Potter’s pal Rupert Grint as Cheetah Chrome, Stana Katic as Genya Ravan, and the always reliable Donal Logue as Merv Ferguson) and a devotion to verisimilitude in the set design (C.B.G.B. 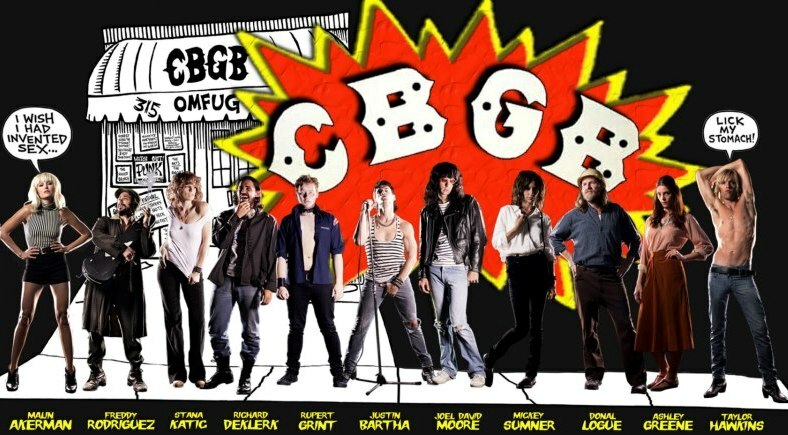 in the movie looks so much like C.B.G.B. in real life, you pretty much recoil at the smell of the bathroom). How, then, does this movie go so abysmally wrong? The swan dive starts with the screenplay (by Miller and Jody Savin), which begins as a traditional biopic centered on Kristal (who, based on my experience, was a kindhearted guy in the right place at the right time, but far from a musical visionary—of all the bands he could have chosen to manage to fame if not fortune, he picked the thoroughly mediocre Dead Boys). However, the muddled movie also tries to be a loving homage to the club and the bands that played there (a plan that derails when actors jarringly lip-sync and pretend to perform those incredible songs on the soundtrack, and when Foo Fighters’ Taylor Hawkins portrays Iggy Pop); a story about the friction between the old-school Bohemian/Communist Hilly and his capitalist daughter Lisa (played by the supremely annoying Ashley Greene), and a sub-Scott Pilgrim comic book rendered by Punk magazine founder John Holmstrom (and here, there are only so many jokes about dog crap and overflowing bathrooms one can stand). The lack of a sustained focus or a solid story is annoying a mere 15 minutes into the film, and it’s so grating by the midpoint that you want to start hurling microphone stands and spitting at the offenders like Iggy or Stiv Bators in full flight. We’re talking several notches below a made-for-VH1 movie in terms of quality control here, and that does much to explain why CBGB showed in one theater in New York in early October (grossing $3,909 at the box office on opening weekend) before pretty much going straight to cable’s On Demand (where I caught it last weekend, and regretted that I’d bothered). Now, the artistic legacy, the timeless energy, and the necessary philosophy of punk rock is cheapened or contradicted by at least 100 little things throughout the movie. But it would be hard to find a nadir lower than the sight of C.B.G.B.’s owner and some of the best musicians the club produced wearing tuxedoes in a bid for validation by a mainstream that the music at its best thoroughly repudiated. Punk is dead; long live punk. Skip this movie (but maybe check out the trailer for some yucks). Rating on the four-star scale: 1.5 stars.